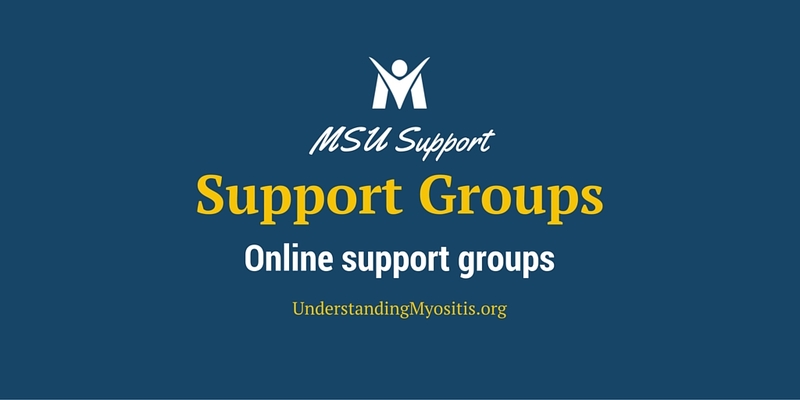 NOTE: For updated information about myositis, MSU, and our programs, use the navigation menu. The information contained below is from 2010 when MSU was not yet a nonprofit, but rather a support group only at that time. 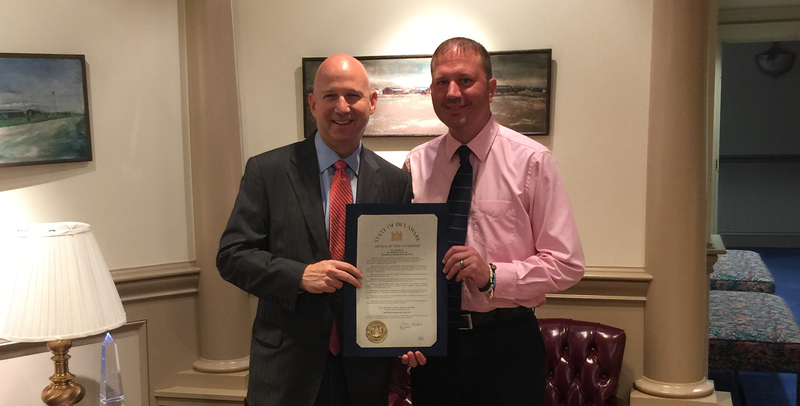 Last Monday, September 21, 2010, was Myositis Awareness Day; a day set aside under a house resolution to bring about awareness and understanding of this rare disease that I and only 30,000 to 50,000 others in the nation have been diagnosed with. 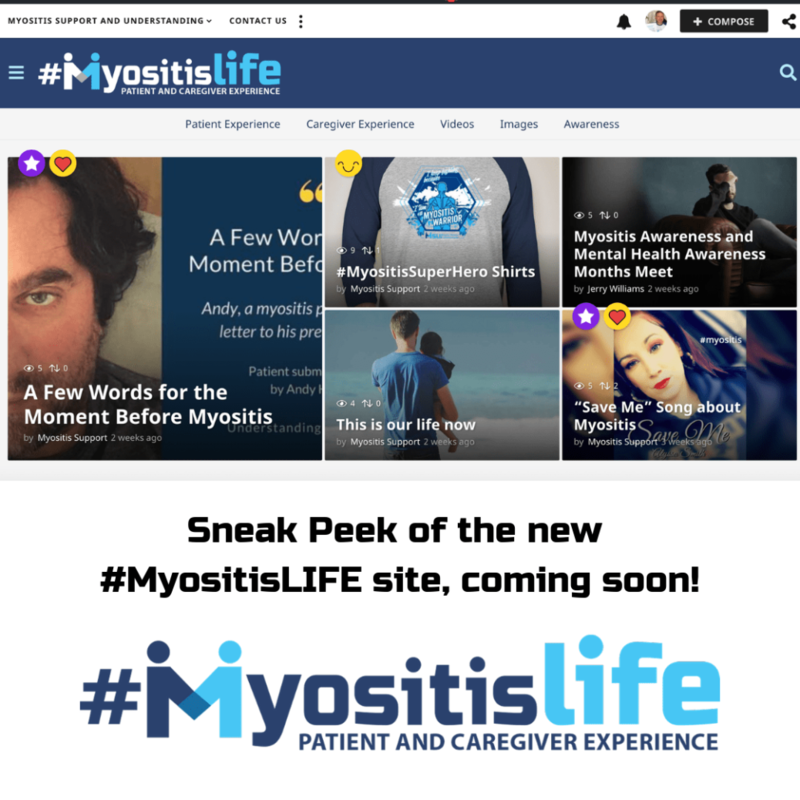 Myositis is the focus of PolymyoWhat.com with the word “Myositis” replacing the “myoWhat” in my blog’s title. Like all national disease awareness days, organization’s, patients, families and companies help to spread the word about a specific illness and help others to understand the disease with goals of reaching out to generate contributions for further research and development of new treatments. 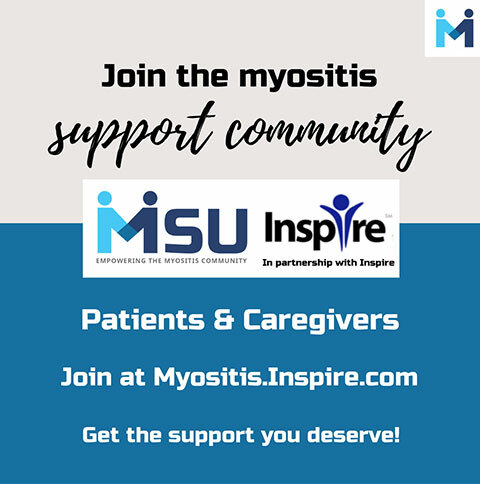 I thought it would be fitting, in the spirit of Myositis Awareness, to explain what Myositis is, explain the various types and help to raise awareness within our community while communicating to the other few thousand people who are going through the seemingly endless journey towards a diagnosis and finding treatments that work. 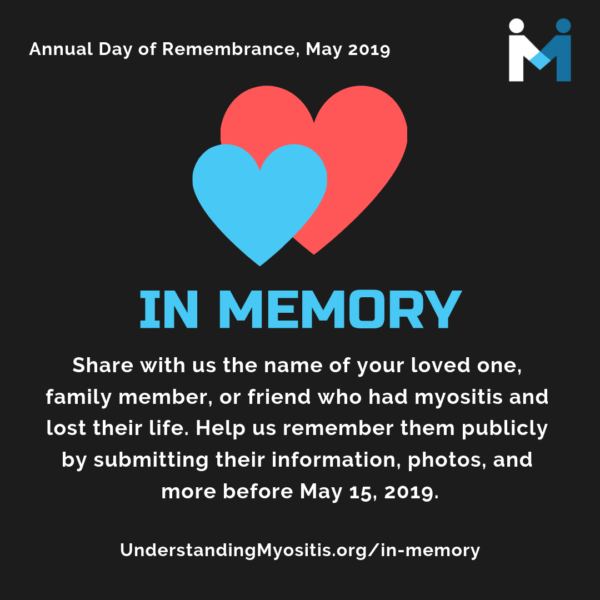 To my fellow myositis patients, you are not alone. I know it seems that way while you are in the dark and trying to figure out what is happening to you but there are others of us out here willing to share our stories and offer hope of better days to come. Myositis is the general term for the disease group and is defined as swelling of the muscles, also called inflammation of the muscles. There are many different reasons the muscles may become inflamed, both temporary and permanent. Many, if not most of you have experienced inflammation of your muscles at some point in your life. Such as when you exercise hard, to the point of muscle failure (when you cannot do any more reps), your muscles become inflamed and swell. This is absolutely normal, albeit painful and once you rest the inflammation recedes. That pain you experience from the exercise is the “no pain, no gain” adage and is truly fitting as the that is the pain I experience every single day. There are other temporary forms of myositis such as medicinal myositis, when a drug you are taking causes muscle inflammation however once the medication is stopped, your muscles will calm and the inflammation will recede. Another temporary form is that of a muscle injury or an infection that causes muscle inflammation. Again, in these circumstances, once the muscles have healed or the infection has been treated successfully, the inflammation will recede. On the other side of muscle inflammation that is not temporary is me and the other patients with myositis that have constant muscle inflammation including chronic pain and a host of other accompanying symptoms. 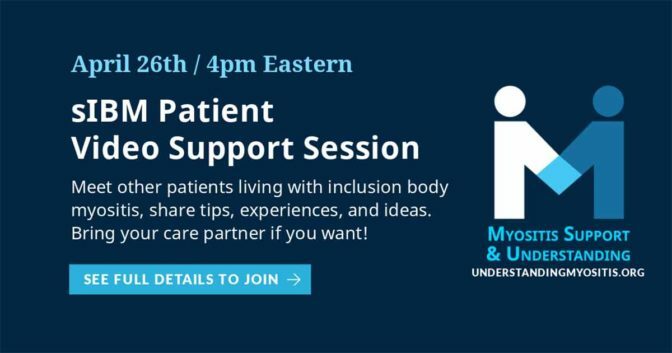 We will only be discussing the myositis in patients like me, not the temporary forms. 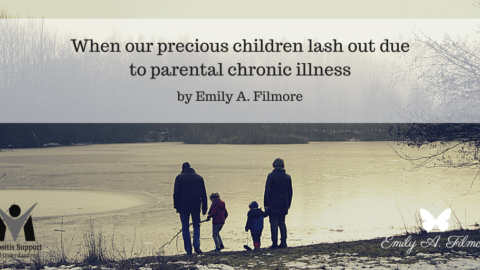 We are dealing with the rare, chronic form that is a challenge for both patients and doctors. 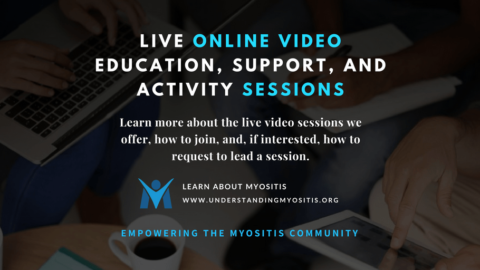 This blog and myositis awareness refers to this serious, rare, chronic form of myositis, otherwise known as inflammatory myopathies. 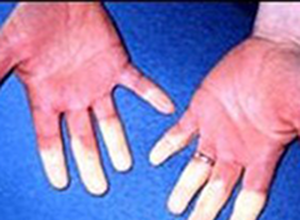 These types of myositis can also be referred to as “idiopathic inflammatory myopathies” where idiopathic means “without a known cause.” In much of the literature and research you can find, many cases are considered idiopathic; however, there is research and much belief in the medical community to prove that inflammatory myopathies are autoimmune diseases in a lot of cases. Many of my physicians over the past seven years have told me straight out that myositis is an autoimmune disease or process. The online research I am able to find mentions the possibility of it being autoimmune while some literature calls it an autoimmune disease. In order to better help you understand autoimmunity, let me explain what autoimmune diseases are and what they are not. First of all, autoimmune diseases are not HIV or AIDS (these are immunodeficiency diseases) and they are not, in my case anyway, contagious. Autoimmune disease is our body’s reaction and over-protection via the immune system gone haywire. When the body’s own immune system, which is there to fight for us against viruses, bacteria, and other foreign matter gets misdirected or becomes overactive it begins to attack our body’s healthy tissue as if it were a virus. This results in the inflammation that is often associated with many autoimmune diseases. In the case of myositis, my immune system somehow became confused or was misled to attack my own normal, healthy muscle tissue. This means that my blood cells are invading my muscle tissue and causing the painful inflammation. This, in turn, causes the muscles to weaken and some patients end up in wheelchairs, bedridden or have the ability to use assistive devices to walk while others are still able to walk unassisted. I have been using a cane for a number of years due to the damage myositis has caused with my leg muscles. In other autoimmune diseases, the immune system attacks various organs or joints depending on the actual disease type. Some examples of autoimmune disease are Crohn’s disease, Lupus and rheumatoid arthritis. Autoimmunity is a very complicated process that I do not completely understand, but this elementary explanation should give us a basic overview in order to understand enough. For more information on Autoimmune Diseases, you can do a simple Google search or check out different types of autoimmune diseases on the Wiki page here: http://en.wikipedia.org/wiki/Autoimmune_disease. 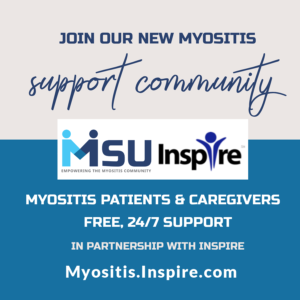 For the purposes of this blog, we will be discussing the chronic forms of Myositis and not the temporary forms I mentioned earlier such as medicinal myositis. 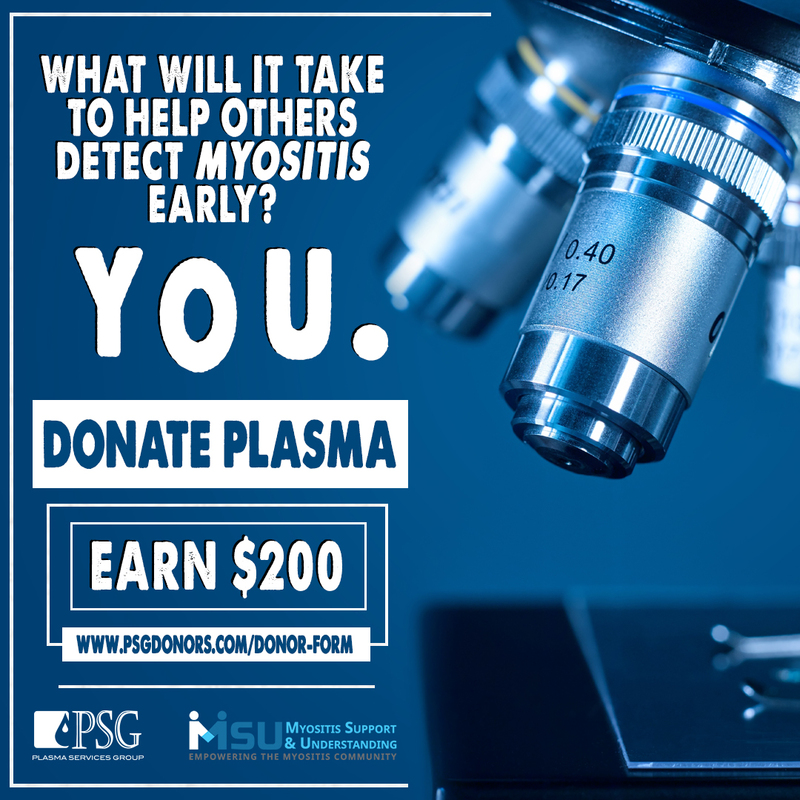 The chronic forms of myositis such as polymyositis are classified as rare diseases by the National Institutes of Health Office of Rare Disease Research (check their website here: http://rarediseases.info.nih.gov/GARD/Condition/7425/Polymyositis.aspx). These diseases are not well understood and therefore are extremely difficult to diagnose. There are 4 types of rare myositis and below I have included brief explanations. 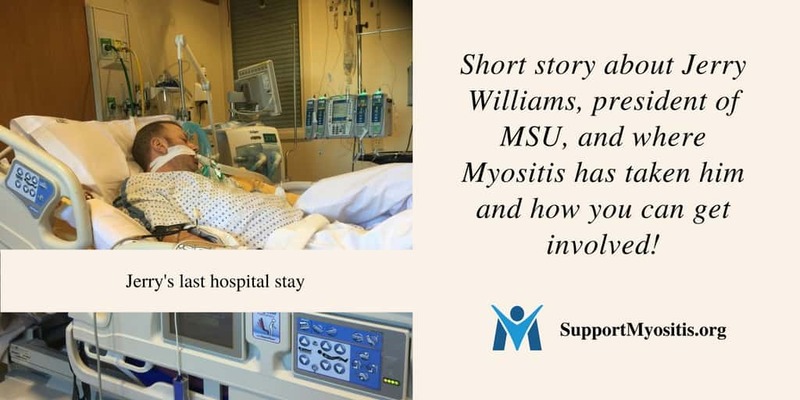 The main focus for this blog is Polymyositis but you can apply the information about myositis to any of the forms or your particular illness if it is myositis related. Polymyositis (PM): One of the rarest forms and one of the hardest to diagnose. As with one of the other forms, there is not a defined skin rash that would help make the diagnosis/diagnostic process easier. Polymyositis is usually found more in women than men and is found in people over 20 years of age (this is a recent update; when I researched a few years ago, it was people in their 50’s or older). The muscle weakness can either happen rapidly, as in my case, over a period of weeks or more slowly such as months. Weakness usually begins with the muscles closest to the trunk of the body such as muscles of the neck, hips, back, upper legs, and shoulders. In my case, the weakness and pain began in my upper and lower legs and has since spread into my upper arms, neck, back, shoulders, and hips. Polymyositis affects mainly skeletal muscle (muscles involved with movement). A number of patients experience severe muscle pain while others may have mild to no pain at all. 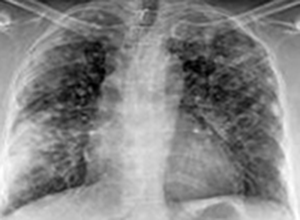 Polymyositis may lead to trouble breathing, severe pain, and trouble swallowing. Also, those of us with polymyositis have a harder time being diagnosed and do not respond well to the current treatments available. There is no cure for polymyositis nor are there an abundance of treatment options because of its rarity (I will explain this one in another post, but it boils down to pharmaceutical companies being “businesses” and they would not stand to profit from development of new treatments or drugs that would only be marketable to 30-50 thousand people unlike, say diabetes, where the drugs could potentially help millions). It has recently been noted that a number of patients with polymyositis may also have another form of autoimmune disease (Overlap Syndrome) and are at a higher risk for malignancy or having an associated malignancy concurrent with the initial onset of myositis symptoms. Some of the other symptoms include extreme fatigue, chronic pain, low-grade fevers, nausea, and inability to rise from a chair without assistance or the ability to lift or maintain holding the arms above the head. 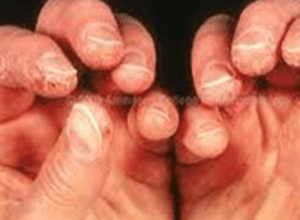 Some less common symptoms include difficulty swallowing and thickening of the skin on the hands. 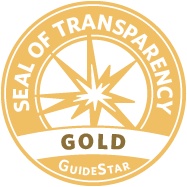 In my case, fatigue, chronic pain, low-grade fevers, and muscle weakness were my initial complaints. Each form of myositis is linked with muscle weakness as a commonality and the weakness is relatively distributed the same, affecting both sides of the body while affecting the muscles closest to the trunk of the body. Dermatomyositis (DM): Per the literature and noted doctor’s opinions, Dermatomyositis is said to be the easiest form of myositis to diagnose. This is due to a prominent skin rash that is often seen prior to the muscle weakness being noted. The rash appears patchy and reddish or purple in color and can be found on the eyelids, cheeks, nose, upper chest, elbows, knees, and/or knuckles. The skin involvement is caused by inflammation of the blood vessels under the skin and the weakness in DM is caused by the immune system attacking the muscles; the same as in polymyositis. The relationship of chronic pain and DM is the same as with the other forms of myositis: some have chronic pain and some have mild discomfort. 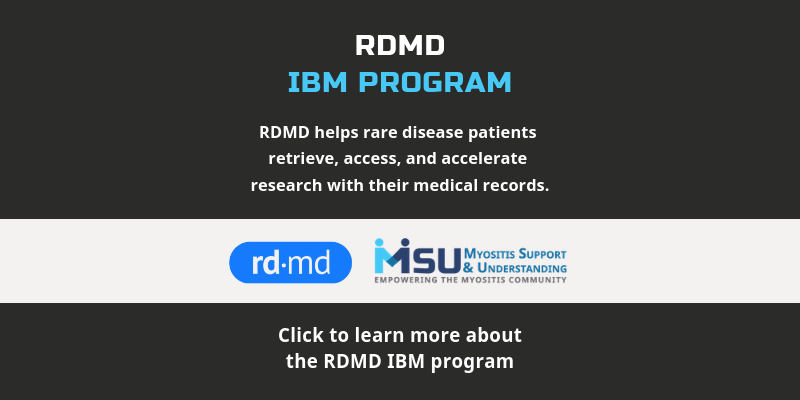 Inclusion Body Myositis (IBM): This form of myositis is found more in men than women and usually presents after age 50. This is the hardest form of myositis to diagnose with polymyositis being second. There is a possible genetic component to this form as well as sporadic cases that have no known cause (idiopathic). This form also progresses more slowly; usually over months and years. There are currently no known treatments for this form of myositis. Also, a handful of confirmed cases of polymyositis end up being misdiagnosed and truly have Inclusion Body myositis rather than PM. Juvenile Myositis (JDM): Juvenile myositis affects children under 18 years of age and there are only 3,000-5,000 known cases. The symptoms are basically the same as the other forms however they start at a much younger age. Many cases can be Juvenile Dermatomyositis or JDM and present with the skin rash and muscle weakness. Cases of juvenile myositis may also experience contractures that can shorten the muscle and can cause joints to bend and remain bent. Exercising the muscle lightly can help prevent this from happening. Some other symptoms of juvenile forms include belly aches, moodiness, fatigue, muscle weakness, rash as seen with Dermatomyositis, difficulty reaching up, trouble lifting the head, and in some cases patients experience a hoarse sounding voice. Children with Juvenile Polymyositis experience all of the above symptoms minus the skin involvement seen with JDM. As I have mentioned, diagnosing myositis is difficult for doctors and even so for the big University hospitals where many patients end up because their local doctors hit a brick wall while putting the pieces that do not match together. Each myositis case can present differently. Some will present with the textbook symptoms and test results while others will present with symptoms but the test results will seem to contradict one another. This is why there is often a long delay and numerous false diagnoses. The major problem I encountered was with my doctors at John Hopkins, one of the so-called best hospitals). On my first visit, we talked for over an hour and the doctors did a physical exam that included blood work. After that was over, they flat out told me my illness was not a physical one but rather a mental one, called psychosomatic disease. The doctors at Hopkins did very little testing, and as you find out neglected to do the main test I would need. So they tell me there is nothing wrong with me physically and there was nothing they could do except to refer me to a psychiatrist. I was infuriated beyond measure and a little scared. It weighed on me for weeks as I thought about the pain and the weakness and fevers; how could I be doing this to myself? I thought I knew myself well enough to distinguish if I was just being lazy and wanted to be sick (for some reason?) versus having a true physical illness. And on top of it, the local doctors look at the Hopkins medical notes and see this and they automatically believe it since Hopkins is a well-renown hospital. This led to so much disappointment yet it fueled a fire within me to get to the truth. So, I did go see a psychiatrist and we talked for quite a while and it was his expertise that allowed me to move forward. He stated in his report (that I had him send to every doctor I had seen thus far) that I was not suffering from any mental disease and my current symptoms were physical in nature and I had true pain from a physical disease along with true muscle weakness. 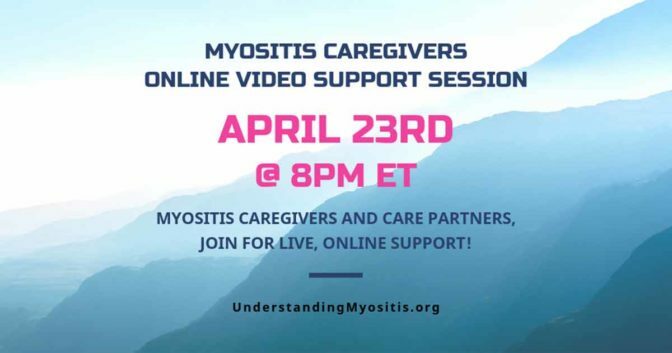 It is situations like these that a lot of myositis patients go through, having to defend themselves against arrogant doctors who think they have the answers but do not take time with the “non-textbook” cases to truly help. I mean they had me thinking for a good month or two that I was crazy and making myself sick. The best way to actually diagnose myositis is via a muscle biopsy usually of a thigh muscle. The surgeon takes a sample deep within the muscle closest to the bone (skeletal muscle). Although there are blood tests that doctors will order and monitor, they only work in some of the patients and are nonspecific in most cases. Thus a muscle biopsy will be performed. After my long battle with Hopkins and 4 or 5 other doctors, I started to see a local Rheumatologist here in town. On my very first visit as we were reviewing my notes from other doctors and hospitals, he asked if I had ever had a muscle biopsy. I was stunned. Immediately it hit me that a muscle biopsy makes all the sense in the world since my main issue was muscle related. It was through that biopsy that, after two years of being sick, I was finally diagnosed with Polymyositis. There were many things I learned from that experience and hope to share with other patients going through similar situations. It is important to keep going and not let yourself give up. This will only cause a deep depression, further weaken the muscles and keep you from getting some type of treatment hopefully sooner rather than later. If you are anything like I was then, you will want to simply stay in bed and hide and try to sleep through the nightmare, but you have to try and stay somewhat active if you can; it is important to keep as much strength for as long as you can. Also of extreme importance is not letting your doctors become complacent. You have hired them to work for you and your health and that also means you can fire them anytime and find another doctor. If my family and I had left it up to my doctors back then, there is a very good chance I would either be wheelchair-bound or would have died by now. That is the honest truth given to me by one of my proactive doctors. If you find yourself with a doctor like I had when I needed a diagnosis and treatment, speak up and let them hear your concerns. If it continues, find another doctor. You know when you are sick so do not allow the professionals that you have hired to give up on you or act as if you are wasting their time. This is your health and their job we are talking about. I am thankful I did not give up. With the new doctor and his order for a muscle biopsy, I once again had hope that something would show and it did. The first part of my medical mystery was solved (later issues to come, however). On my return visit to my doctor for the results, I found that the first part of my medical mystery had been solved. The muscle biopsy, as I mentioned, confirmed that I have polymyositis (inflammatory myopathy) and it was time to start treatments since so much time had been wasted. Armed with the proof of my illness, polymyositis, and on my doctor’s suggestion, I returned to Hopkins for them to review my case once again. After much talking with the two physicians, I was again told that I do NOT have myositis and they wanted to see the actual biopsy slides rather than just a report. I called the appropriate hospital to have them send the slides to Hopkins and a month later I received an addendum to their initial report stating that I do in fact have polymyositis. A victory? I am not entirely sure. It was more frightening and disappointing if anything and I felt I was owed an apology considering it was their initial report that placed psychosomatic disease into my medical reports allowing other doctor’s to think the same and leaving me without a diagnosis and more important, treatment. As you may assume, I have never returned to Hopkins since then, even when they opened their new Myositis Center. It is run by the doctors I saw back then and I simply do not feel comfortable with them treating me. Even though it took a long time and was hard on me and my family, it finally paid off and I could let go of that part and begin anew with treatments to help me gain my life back. Being diagnosed is only the first step, a long step for most, but only the first. Finding treatments is another challenge for patients with myositis. As of this writing, there are no specific treatments made especially for myositis. This is one reason Myositis Awareness is so important to me. We, as patients, are usually started on Prednisone (steroids) as the first treatment option to attempt to reduce the muscle inflammation and thereby the pain as well. Steroids have a wide range of side effects and must be managed properly or they can cause serious damage to your body. 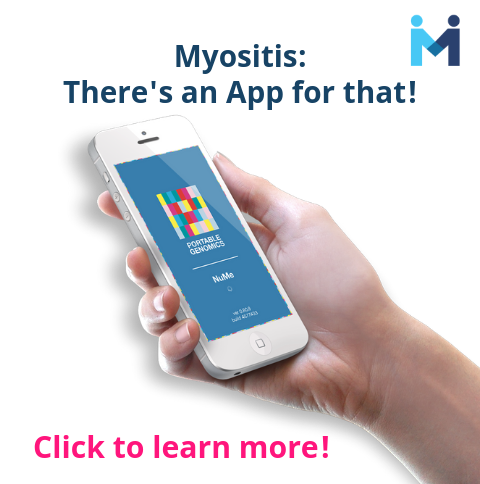 As for other treatments, myositis patients are often given drugs that have been on the market for a while and were developed for other types of autoimmune disease. The typical drugs are usually immune suppressant medications such as, in my case, Cell Cept and Methotrexate (is actually a chemotherapy drug). These work by suppressing the immune system to slow down the attack on the muscles and to hopefully reduce the inflammation and pain. University hospitals and drug companies undergo drug trials to gauge the effectiveness of current drugs on the market and their effect on myositis patients. If a drug shows favorable results, it can then be approved for treatment of myositis. This is important since insurance companies will not approve expensive medications unless they are approved for specific diseases. For example, Cell Cept runs about $3000 a month and luckily it has been approved to treat myositis so my insurance covers most of the cost. Various treatment options are important since each myositis case responds differently. I personally have been on numerous medications and infusions or combinations of more than one. Treatments for myositis seem to be more of a trial and error situation and each treatment requires a number of months before it can be termed effective or not. So pill after pill, shot after shot, infusion after infusion, if the drugs do not work we have lost more time and have given myositis another chance to do more damage. As you can see, the common link between the different types of myositis is muscle weakness (caused by inflammation) and pain in a lot of cases. 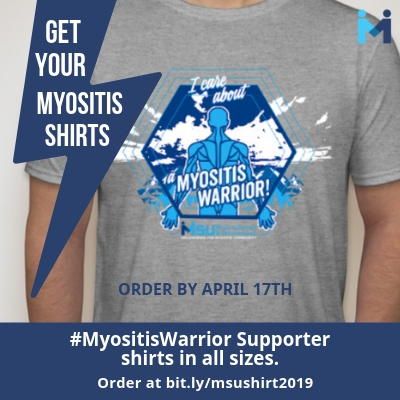 It unnerves me that back in 2003 when I first became ill, my doctors had included myositis as a possibility but quickly took it off the list because I was in pain and back then pain was not considered a part of myositis. In the literature back then it stated that in a small number of cases (25%) pain was a symptom with myositis. And, to me, that felt like proof enough that I could have myositis since it had been reported in at least some cases. Hopkins told me no way; pain is not found in myositis. The literature out there now states that a large number of myositis cases experience pain, so apparently research has been ongoing and they are finding out more and more each year. I will admit that nothing about my illness has been easy for me, my partner Charlie, and my family or even for my doctors. Each and every symptom has either contradicted one another or the testing would contradict other testing. But, I finally got the diagnosis and have been treating it which is a huge improvement over not knowing at all. And, at that time, we did not know that polymyositis was the only thing wrong with me – there was and is something going on with my bone marrow (my overlap syndrome) and I will cover that much later in this blog. Having myositis is, as you have read, painful, emotional, tiring, debilitating, and depressing. Think about all of the sudden losing everything you once knew: your job, ability to drive, ability to walk and run, losing friends because they no longer know what to say or do, waking up or staying up all night due to bone-crushing pain and the list could go on and on. There is so much loss accompanied by chronic illness and it is easy to become a negative person. The thing is that being negative requires even more energy so we must stop and try to find the good things we still have and for me, have gained by having myositis. It may sound crazy to some, but I have truly learned so much about life and love from being ill that I do not think I would trade this knowledge and these experiences for never having had to deal with myositis. 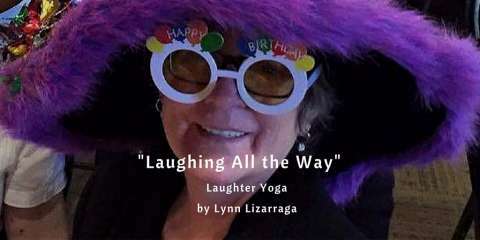 I thank you all for taking the time to read about myositis and my experiences with it. I hope you have learned something that may be useful down the road. Until I continue my journey with you, make sure to look at someone and smile! Update: As of 2014, “Polymyowhat: Understanding Myositis” no longer exists. 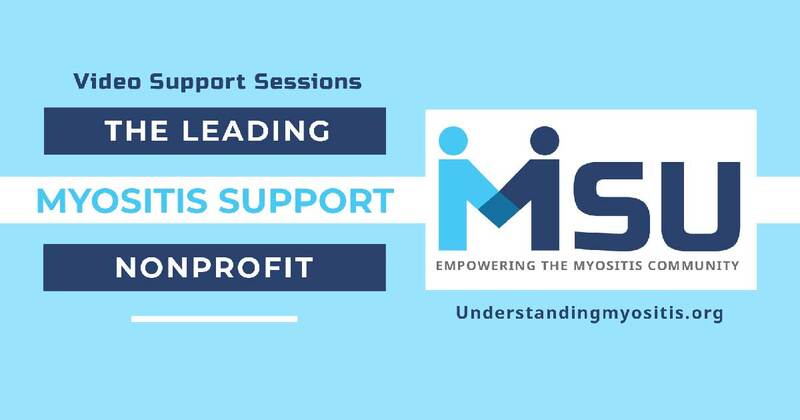 Rather, it has become “Myositis Support and Understanding” with an active, working board of directors.